Many Learning & Development managers spend a lot of their time thinking about ways in which they can make their departments more effective and provide real value to the organisation. The question is usually ‘what can I do to ensure that the CEO or Director views L&D as a strategic business tool and not another also-ran support function’. There’s no silver bullet solution for increasing the impact and the profile of L&D. However, there are some key areas that are worth focusing on and some basic principles that can be applied. Below I’ve listed five basic actions that every L&D and HR leader should take if they want to raise both the impact and profile of their Training/Learning & Development operations. A good starting point in L&D governance is to establish a solid model that ties L&D activities tightly into business priorities (that’s vital for the second action, below). Governance isn’t necessarily tied to structure. Many different L&D organisational structures work just so long the body responsible driving the vision/strategy is totally focused on organisational objectives and priorities. To achieve this, the L&D Governance Board (or whatever you choose to call it) needs to be strongly represented by senior business leaders. They’re the people who should be making decisions about L&D priorities, not HR, not L&D. They’re the key stakeholders and the people who are responsible for executing the overall organisational strategy so they should know where priorities lie. The diagram below provides a good model for establishing a governance structure. It is 3-tiered. The top tier provides overall direction, formulates and drives the strategy. Ideally it consists of about 10 members with most being senior business leaders (EVP or Head of Department level) who have a stake in ensuring L&D delivers what the organisation needs. Ideally this board is chaired by the CEO or Director of the organisation but, if not, then the CFO, COO or HR Director. The key here is to ensure that HR/L&D is not over-represented. They should be a minority on the board. The second tier ties the various business units into overall strategy. 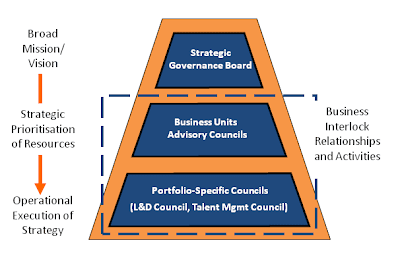 They feed data/information/perspectives up to the Strategic Board so it can make its decisions and, in turn, take Strategic Board decisions and work out how to execute them – how to prioritise L&D resources to best effect and how they can maximise ‘bang for buck’. Again these Councils (or whatever you choose to call them) need to be driven by senior managers, not by HR/L&D if you want to maximise alignment, impact and results from L&D activities. Even outside the overall governance of L&D, managers in the line of business need to be L&D’s best friends. There’s a couple of simple reasons for this. [a] Most employee development is in their hands, whether they appreciate that fact or not. The vast majority of learning occurs under their watch in the workplace. 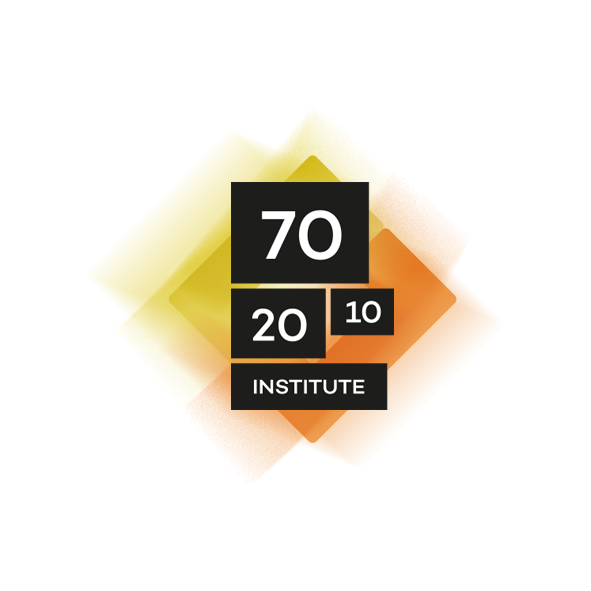 The estimates are that around 70-90% of employee learning and development occurs there. Not only that, but research results from the Corporate Executive Board show that a manager’s actions such setting clear objectives and explaining how they plan to measure performance have far greater impact on employee performance than any amount of change in skill and knowledge level (19.8% improvement for the former versus 6.7% improvement for the latter). Any L&D manager who is not casting a critical eye over everything their operation does and is not continually looking for better ways to make an impact should needs to re-evaluate their position. Innovation leads to business value creation. Not always, but unless the L&D department is innovating it will never find the things that will drive business value. There’s plenty of evidence that the vast majority of L&D functions are still working ‘in the red’ as regards the cost/value calculation. The world of L&D is moving in Internet time. Leading L&D thinkers and practitioners realise that learning is not about running courses and programmes. There’s enough evidence to prove that the majority of formal learning/training activities have no impact on employee, team and organisational performance at all. L&D needs to step away from all that ‘busy work’. L&D managers need to understand that their job should be focused on working with their stakeholders to provide the tools and environments, the opportunities, and the networks to help foster a culture that will lead to ‘real learning’ and performance improvement – changed behaviour in the light of experience. If they stick to dedicating most of their time to designing learning events they are unlikely to be adding real value. Technology has changed almost every aspect of life. Yet much of what is done in the name of L&D is still similar to as it has been for 100 years. eLearning has gained a foothold, but a lot of eLearning is simply the course paradigm moved wholesale into electronic format with identical structure to former classroom courses – aims, course objectives, sections, topics, lots of content, little engagement, rare attempts at collaborative or learner-directed approaches unless you consider the opportunity to follow branching trees as ‘learner directed’.. Yet there is an absolute wealth of tools to help L&D people raise their game by using technology. Just have a look at Jane Hart’s Centre for Learning & Performance Technologies site, She has more than 3,000 tools listed in her Learning Tools Directory, with more than 2,000 of them being free to use. Everything from podcasting tools, wiki tools, social networking tools, screencasting and conferencing tools, blogging tools and so on. I wouldn’t suggest that every L&D manager dives headlong into a bucket of learning technology tools, but if you want to provide a better service and change the way you’ve always been supporting learning you'll need technology to help you do it. There’s sure to be something out there that will work for you. And it’s likely to be free or at least very inexpensive. The fifth action required to make L&D meaningful and relevant is to ensure you have the right capabilities and attitudes in your team. Only then will you be in a position to lead your organisation to develop a true learning culture. You will need people in your team who can work as effective internal consultants, engaging with stakeholders and carrying out root cause analysis to help solve business problems. Don’t assume that someone who has experience in conducting training needs analysis has the right skills for this important job. This requires real consultancy skills, and the ability to work with business managers to understand whether training can even impact the problem (which, mostly, it can’t). These people need to have the skill and the acumen to guide often insistent managers away from a training solution when the root cause analysis indicates that the problem is due to something other than lack or knowledge or skill (which, mostly, it is). And don’t be persuaded that an HR business partner can do this job for you. They can’t. I’ve yet to see an HR Business Partner who has a good understanding of the performance consulting process and had a good grasp of what works in adult learning.It requires specialist L&D skills and a basic L&D module in your HR qualification isn't going to equip you to do the job properly. If you don’t have these consultative capabilities in-house, then you may be better hiring in external experts until you can either hire or build your own in-house capability. These people are your key ‘front-line’ troops. Every time they revert to order-taking, they will be inhibiting you from adding real value and tying you up in ‘busy work’ of no real value. You may, of course, also need some of your team to be involved in developing and delivering courses and programmes, but this will be a shrinking number as the world moves away from the less effective model of learning ‘events’ and further into workplace supported learning processes. All of these team members should have a good grasp of ‘the art of the possible’ and the potential for use of technology. Every L&D department has the opportunity step up and add real strategic business value rather than continue to act as a support function and an also-ran. There’s a great opportunity for L&D to become a meaningful, relevant and indispensable part of the organisation in many more instances than currently exist. However, without taking actions such as those discussed above it’s unlikely that they’ll make the transition. If they don’t, then the future is bleak for them. When economic times are tough, the lens is focused on areas that are not paying their way and contributing value. I can see some CEOs, CFOs and Directors simply pulling the plug on their L&D departments and handing the budget off to others who they think will put it to better use. The amount of time, effort and money wasted on formal ILT training prior to rollout or upgrade of enterprise platforms (particularly ERM and CRM) and other new software systems is really quite amazing. Some managers and L&D people just don’t seem to get it. The evidence has been around for a long time that formal training on detailed task and process-based activities in advance of the need to carry out the task or use the process is essentially useless. The logic and evidence both point to the fact that the “we’re rolling out a new system, so we’ve got to train them all” approach employed by many (read ‘most’) organisations, and offered as a service by training suppliers across the globe, is both inefficient and fundamentally ineffective. Even if you’ve never been involved in training for rollout and upgrade and then finding that users demand re-training or simply call the help desk as soon as go-live happens, it helps to be aware of some fundamental truths about this flawed model. Most pre go-live training is delivered through ILT or eLearning and is content-heavy. The instructional designers and SMEs feel the need to cover every possibly eventuality and load courses with scenarios, examples and other ‘just-in-case’ content. I have seen multiple PowerPoint decks of 200-300 slides delivered over 2-3 days for CRM upgrades. Few humans can recall this amount of information for later use, or even a fraction of it. Maybe if they have photographic memories they can, but designing for photographic memories is not really a sensible strategy. The rest of us just park most of what we do remember at the end of the session in the ‘clear out overnight’ part of our brains. And all those expensively-produced User Guides are simply a waste of the Earth’s limited natural resources. They tend to be too detailed, linear, full of grabs of screens that the user will never refer to, impossible to navigate, and the last thing people reach for when they need help in using a new system. They are far more likely to reach for the phone and call the Help Desk. Training User Guides are quintessentially shelfware. Usually the only time someone picks user guides off the shelf is to throw them in a bin (hopefully one marked ‘recycling’) during a clear-out or an office move. 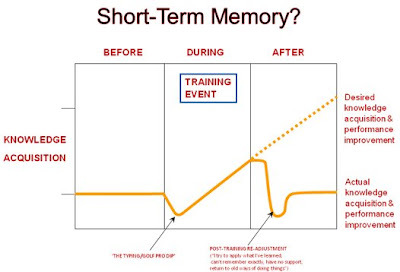 Embedding knowledge in short-term memory and long-term memory are two very different processes. Even the information that can been recalled immediately after training - and that’s likely to be minimal – will be lost if it isn’t reinforced through practice within a few hours. Practice and reinforcement are required for the neurological processes of conversion to long-term memory to occur - chemicals in the brain such as seratonin, cyclic AMP, and specific binding proteins do that job. Do you think Tiger Woods’ brain retained the details of how to arrange his body to hit a ball 400 yards without practice and reinforcement? Harold Stolovitch & Erica Keeps carried out some very interesting research on desired vs. actual knowledge acquisition and performance improvement. The work uncovered some important observations. The graph above shows the results. During the training event, following an initial dip - the ‘typing/golf pro dip’ – where performance drops as new ways of carrying out tasks are tried out, knowledge and performance then improve to the end of the training session. The individual walks out the door knowing more and being able to perform better than when they started the training. The drop-off following the training event (called ‘post-training re-adjustment by Stolovitch and Keeps) can kick-in very quickly, possibly in a matter of hours. You finish a day’s training course, go home, sleep, and by the next morning a lot of what you had ‘learned’ has been cleaned out of your short-term memory. Bingo! The only way knowledge retention and performance can follow the dotted line upwards is if plenty of reinforcement and practice immediately follows the training. Even better if this is accompanied by some form of support – from line managers setting goals and monitoring performance, from SMEs providing on-demand advice and support, or even from learning professionals providing workplace coaching. 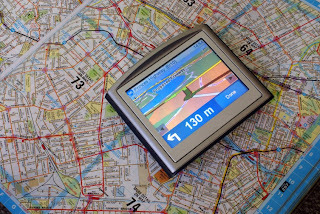 ePSS/BPG tools provide context-sensitive help at the point-of-need and “act like a GPS system rather than a roadmap” as Davis Frenkel , CEO of Panviva Inc., the company that produces the very impressive SupportPoint BPG tool, explains. “When you’re learning to follow a process, you just want to know the next 2-3 steps you need to take. You don’t want to have to remember the entire 20-30 process steps and all the options”, Frenkel says. I think he’s absolutely right and it’s a good analogy. A GPS tells you that you need to ‘turn left at the next intersection’ or ‘take a right turn then keep straight ahead’. It instructs incrementally, and doesn’t tell you every turn on the journey when you set out. When there’s no access to GPS and the driver has to revert to a map (and doesn’t have a flesh-and-blood GPS sitting beside them reading the map and instructing in increments) they will tend to read and memorise just the next 2-4 turns on the journey and then re-read the map to get the next set of instructions. Job done, destination reached. So why don’t many organisations and L&D folk wake up to the failings of using the wrong approaches to achieve their required outcomes? Why are millions of $/£/€/¥ spent every year training employees on using enterprise systems in this way when there’s evidence to prove that it simply doesn’t work?